Tomorrow is the official start of Mercedes-Benz Fashion Week, and I'm in for a 13-hour jam-packed day, which means lots of running around with no time to eat. Here are some healthy snack options that you can expect me to be throwing in my bag and snacking on in-between shows. 1. Bare Fruit Apple Chips - 100% baked and made with 100% made with USA grown apples. It's free of preservatives and artificial sweeteners, fat, free, gluten free and a good source of dietary fiber. I love the crunchy texture, especially when you add it to oatmeal, salad or yogurt. Flavors include Fuji Red (my favorite), Granny Smith and Cinnamon. I can't wait to try their newest flavors, Sea Salt Caramel and Chile Lime! 2. 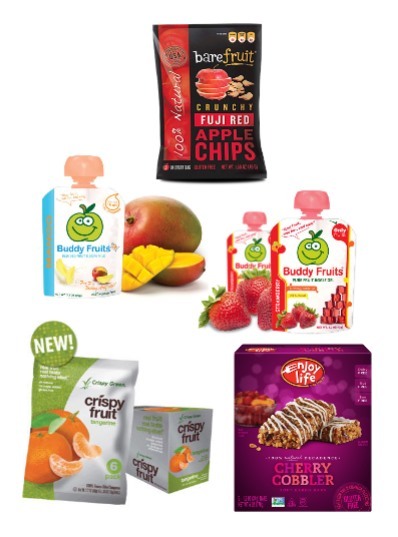 Buddy Fruits - squeezable snacks including Blended Fruit & Milk smoothies (70 calories) in Mango, Banana and Peach flavors. I also love the Pure Fruit Giggle Gel (70 calories) in Strawberry, Orange and Raspberry. Tropical Coconut Milk Pure Blended Fruit (100 calories) are a refreshing snack for coconut lovers. These healthy snacks are free of preservatives, colorings and artificial flavorings. Superfruit pouches (80 calories) in Raspberry & Cranberry and Blueberry & Blackcurrant flavors are the ideal snack if you plan on working out or running across venues for those back-to-back fashion shows. 3. Crispy Green Crispy Fruit - all natural freeze-dried fruit snacks with a light crispy texture. Their snacks contain natural fruit fiber and nutrients, with only 40 calories. No additives or preservatives or fat or cholesterol. Crispy Fruit Tangerine is the latest addition added to the Crispy Fruit line. If you want to try an assortment, look for Crispy Green Variety Packs, featuring Crispy Apples, Crispy Mangoes, Crispy Asian Pears, Crispy Bananas, Crispy Cantaloupes and Crispy Pineapples. 4. Enjoy Life Decadent Bars - flavors include S'mores, Chocolate SunButter and my two favorites - Cherry Cobbler and Cinnamon Bun. All bars are gluten-free and free from the most common allergens.